Easy and delicious! This is how to serve gnocchi when you need a quick and healthy weeknight meal. Following instructions on gnocchi package, bring water to boil. Once boiling add salt and gnocchi until gnocchi floats, about 2-3 mins. Meanwhile heat a medium sized skillet pan on medium/high heat. Add oil and sauté onions until translucent and slightly caramelized, about 10-12 mins. Add garlic to onions and sauté for 1 min. Working in batches, add spinach, stirring frequently until wilted. Once spinach is cooked, turn off heat and immediately add pesto. Stir well. 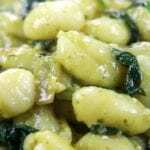 Once gnocchi is cooked, drain and add to pesto mixture. Stir well and garnish with parmesan cheese. Cover with a lid for 3-4 mins to help cheese melt and then serve immediately.